Winter is coming to an end and we are looking forward to Spring when the days become longer and the grass starts to grow and hopefully less rain and wind. It has been very mild this winter, but the alpacas have still grown lovely thick fleeces ready to be shorn off in June. Buy online or come and visit Coco Alpacas by making an appointment via email jane@cocoalpacas.co.uk, or tel 01694 751792 Mob 07989 740376. We will be holding an Open Day at Coco Alpacas on Saturday January 26th from 10am – 3pm where you can see the alpacas and the lovely products we sell. Here are the events we will be attending this summer. The British Alpaca Society have an annual National Show and for the past five years it’s been held at Telford International Centre. Over 600 alpacas were at the show this year coming from all over the country. The 2 days are filled with showing the alpacas on the quality of the fleece. They are put into different categories Huacaya and Suri (2 different types of alpaca), colour and age. The quality of the fleece is judged on the micron, staple length, density, crimp and consistency throughout the fleece. At the end of the 2 days a supreme champion from the Huacaya and Suri group will be crowned and the winners this year both came from Houghton Hall Alpacas, Huntingdon, Cambridgeshire. There was also a fibre zone competition made up of various categories – household, shoulder wear, neckwear, garments, toys & yarn. 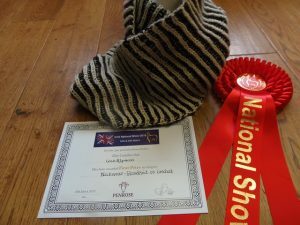 We entered in a few categories but we were absolutely thrilled to win the Neckwear category with a hand knitted brioche Infinity scarf made with Coco Alpaca yarn and knitted by Jen Bartl who calls herself The Prolific Crafter and is part of the Coco Alpaca team. The fibre zone was judged by Alison Pearce and Iain Ager who are both from Newman Pearce Tailoring in London. 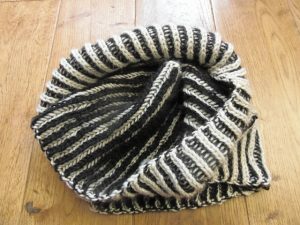 We also had a stall at the show which was very successful, so all in all we had a very good week-end and the win with our Infinity Scarf was the icing on the cake!